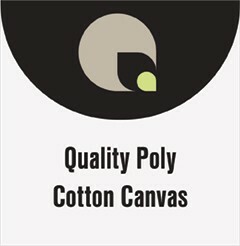 Quality Poly Cotton Canvas has a bright white canvas that can be used in a variety of applications including fine arts and commercial uses. The cotton/polyester blend was designed to provide an exceptional color gamut that is water resistant when using latex or aqueous inks. Provides a high white point that presents a consistent image on the surface. Ideal for commercial graphics, photographs, fine art, and retail/office décor. Compatible with aqueous, UV curable and latex printers.